Arlene Ilg specializes in the areas of lead poisoning, labor law, and medical malpractice for Ronemus & Vilensky. Ms. Ilg’s expertise in these areas comes from her first-hand experience successfully handling many of these cases. Ms. Ilg has more than 10 years experience as a researcher and writer on various legal issues. After graduating from the State University of New York, Stony Brook, in 1988, Ms. Ilg attended Benjamin A. Cardozo Law School. 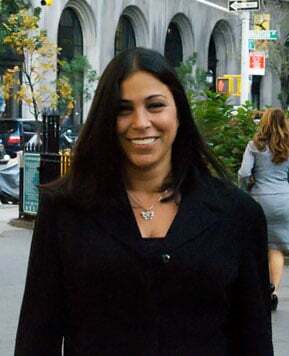 She graduated in 1995 and was admitted to the New York Bar that same year. Her legal research and writing skills, as well as her in-court experience, have qualified Ms. Ilg to collaborate on several articles that have been published in the New York Law Journal and other legal journals on issues concerning construction accidents and lead poisoning cases.